Despite the slightly blurry picture, we can still recognize this creature by its distinct shape. 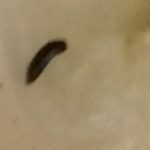 We believe the specimen our reader has found in her bathtub is a case bearing moth larva! 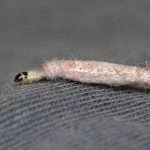 While they are known in the scientific community as Phereoeca uterella, people also know these larvae as household casebearers and plaster bagworms. 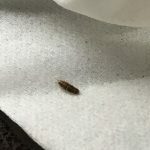 Though case bearing moth larvae are sometimes considered to be pests, they are more of a minor inconvenience than a major headache, so our reader doesn’t need to spend a bunch of energy worrying about finding one in her home. A case bearing moth larva forms its “case” (which is the almond-shaped shell in the photo) during its first larval stage. 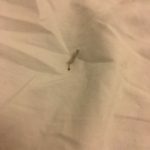 First, they secrete silk to form the general shape of the case and this silk will provide a safe home for the larva on the inside of the case as it eats and grows. Meanwhile, the outside of the case collects tiny particles of sand, dust, dirt, and other debris. These larvae eat spiders, spider webs, wool carpet, and wool clothing. Once the larva has had its fill, it crawls up a vertical surface and attaches its case to the wall using secreted silk. Inside of the case, the larva will transform into a moth and leave the case behind. People usually never see the actual larva, instead they just notice the abandoned cases. 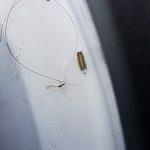 Our reader found this specimen in her bathroom, but there might be other larvae in different areas around her home. 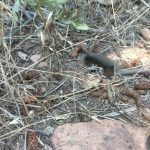 She should keep an eye out for cases and case bearing moth larvae, especially checking areas where she stores wool clothing or where she notices spiders. She should sweep up any that she notices and put them outside. To prevent future visits from case bearing moth larvae, she should vacuum and sweep her home regularly. 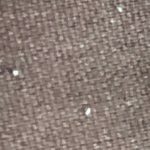 Other preventative measures include installing a dehumidifier, using moth traps, and making sure that all of her doors and windows are properly screened and sealed. 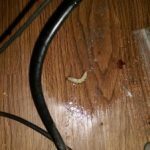 We wish our reader the best of luck dealing with these larvae! A reader recently sent us a photo and asked us "What is this thing?" 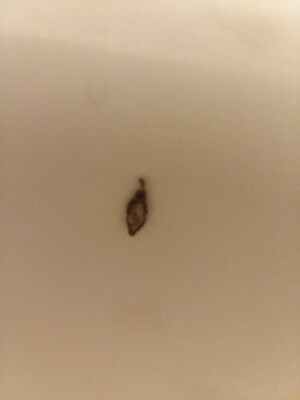 She found it moving around in her bathtub and would like to get rid of it as soon as possible.